I have a confession. I’m a Pinterest addict. To date, I have 90 boards and 2,875 pins. Between school ideas to recipes to crafting, I can’t get enough of it. Since a lot of my friends are educators and I follow many educators on Pinterest, I’m always impressed by all the neat and creative ideas they pin. My latest obsession would have to be paint chips. I’ve seen them on Pinterest used for artwork, as bookmarks, gift tags, flashcards, and scrapbooks and even as a chandelier. 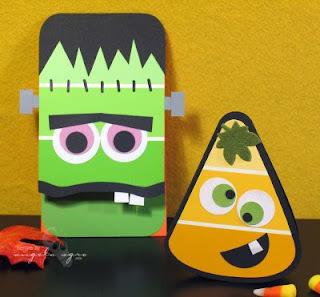 Seriously, how cute is this Halloween project? 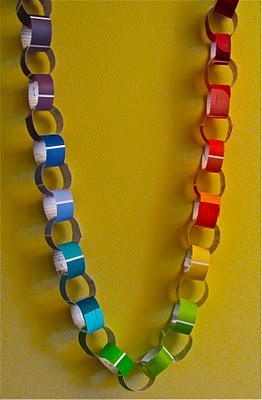 Or what about 100 day countdown chain? I love these journals made from paint chips! You could even purchase these here if you didn't want to make your own. 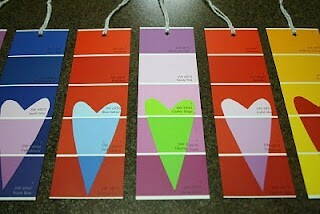 You can find a ton of bookmark ideas using paint chips. It would be fun to let the kids spruce them up with stamps, glitter, stickers or other fun embellishments. 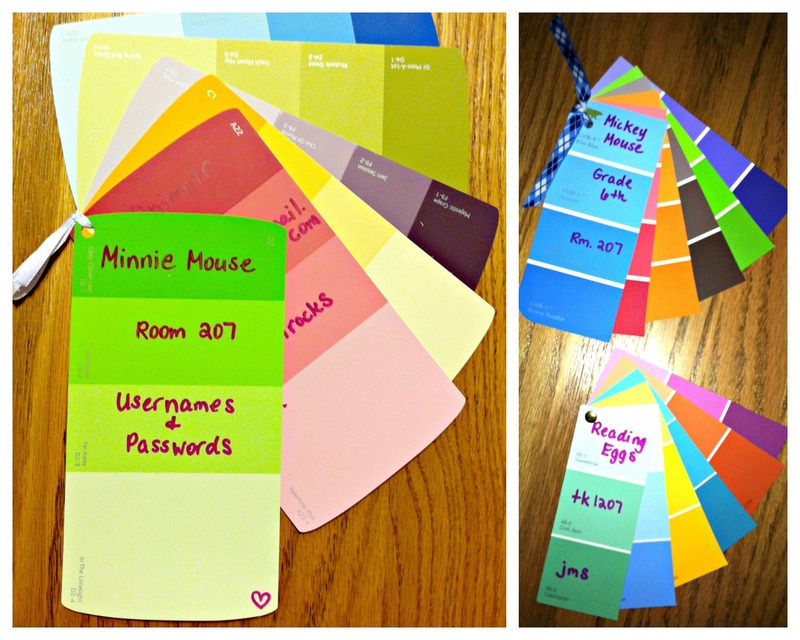 Needless to say, if you search “paint chips” on Pinterest, a ton of cool ideas will come up. That’s how I stumbled across this great idea for keeping track of student usernames and passwords. In the pasts, I collect slips upon slips of paper, all different sizes with student usernames and passwords and they end up cluttering my desk. Since we needed things for the house, I headed out to Menards and Home Depot and picked up three different kinds of paint chips. I wasn't sure which layout I wanted to go with. At Menards, I picked up paint chips by Dutch Boy and Pittsburgh Paints. At Home Depot, I ended up getting Behr. I did feel a little guilty taking the paint chips but since I am going to be painting my new house, I guess I justified my cause. Plus, I told the workers at each place what I was using them for and they said take as many as I like. I guess that’s good since I have 600-700 students. I’ll probably encourage my students to get some as well to contribute to the class if they ever make trips to these stores. 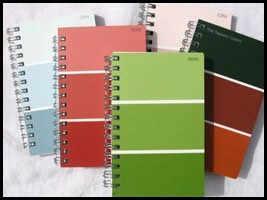 I’m still deciding which set of paint chips I like the best. I might have the students vote. For now, I wrote in the information as an example but for the little guys, I might run off their info on labels and just have them stick it on. We'll see. I think it would be fun for them to decorate the one on the top with their name. I know some of my students just love to bedazzle things. rulers. com for $5.81 so I might just buy them and reuse them each year. So that's my little Pinterest project of the week for my classroom. If I was a homeroom teacher, I would probably incorporate paint chips into just about everything and every subject. 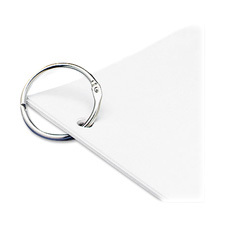 However, for now, I'll use them to add some color to my room and store information in one place. If your looking for more inspiration in education on Pinterest, feel free to check out my boards. I have a board labeled "Education" since I did use to be a 5th grade teacher and you never know when I might go back to having a homeroom or there are ideas that can have technology integrated into them as well. Of course, I have one labeled "Technology Education" that is growing.